(b. Los Angeles, USA 1961. Lives and works in Los Angeles). 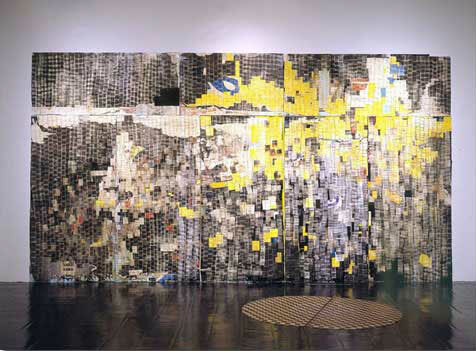 Mark Bradford received his MFA in 1997 from the California Institute of the Arts. His work has been described as dealing with his immediate environment that includes until very recently, owning and working as a hairdresser, living and working in the predominantly African-American neighborhood of South Los Angeles, and the urban Southern California environment that is in a constant state of flux. His earlier collages on canvas of singed hair-permanent endpapers (the small rectangles of transparent paper used by hairstylists) were often minimally composed. His newer works, large scale collages that use street signage and advertisements, often applied then peeled off or stained with bleach relate to his interest in informal economies and cultures. A selection of recent solo shows include: 2005 (upcoming) Insite_05, San Diego-Tijuana; 2003, Very Powerful Lords, Whitney Museum of American Art at Philip Morris, New York; 2002, Mark Bradford, Patricia Faure Gallery, Santa Monica; 2001. I Don't Think You Ready For This Jelly, Lombard-Freid Fine Arts, New York. Bradford’s most recent group shows include: 2004, Bounce, REDCAT, Los Angeles; ARCO 2003, Madrid, Spain (curated by Lauri Firstenberg); 2002, Mixed Feelings, USC Fisher Gallery, Los Angeles. 2001, Freestyle, Studio Museum in Harlem, New York. He is currently represented by Brent Sikkema Gallery in New York. In this 2003 interview Bill Kelley Jr sits down with Bradford in his Los Angeles studio to discuss his interest in the hybrid spaces around his studio made up of Latino and African-American cultures and communities.